SSV-33, the sole Project 1941 "Titan" 'KAPUSTA' class command ship. This gigantic ship, a 36,000 ton nuclear-powered command ship built on the hull of a Kirov class cruiser, is one of the most unusual ships in Soviet/Russian service. The ship serves the combined roles of fleet flagship, space tracking ship, missile tracking ship, electronic intelligence ship, and communications relay ship. Official designation is Sudno Suyazyy, translated as communications vessel. The NATO name 'KAPUSTA' means 'cabbage', in reference to the giant dome on her forward superstructure. The vessel is laid up in the Pacific fleet because her operating costs cannot be afforded. 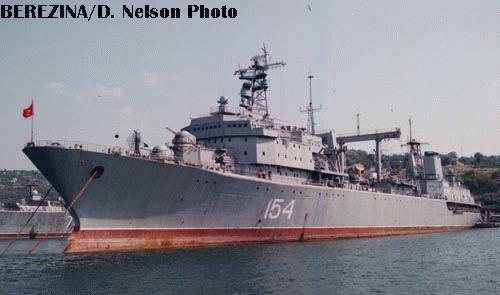 The sole Project 1859 multirole replenishment ship, Berezina, at Sevastopol, 8/1995. 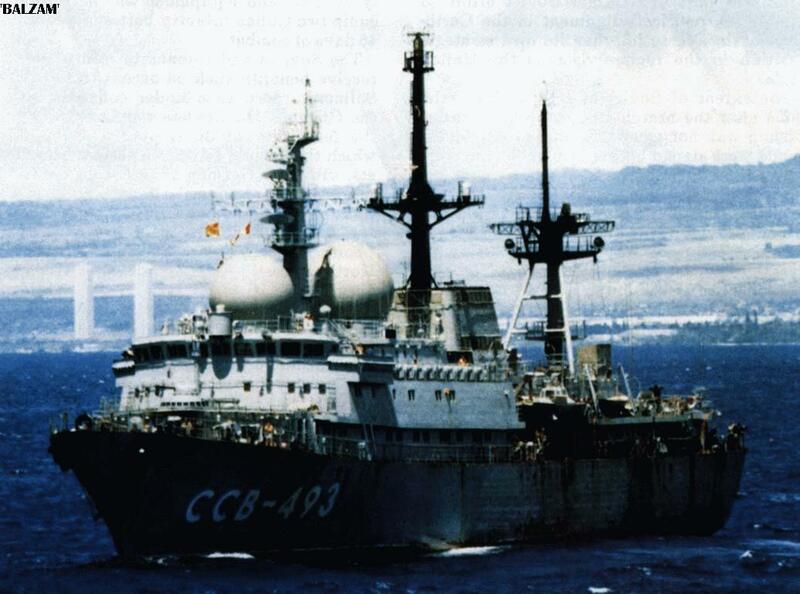 This is the largest Soviet/Russian replenishment ship, and the only one really equivalent to Western AOR/AOE types. She can supply fuels, munitions, stores, spares and repair service; equipped for UNREP, VERTREP, and alongside (tender) transfer. Reportedly she may be sold or scrapped soon. Dubna class tanker Sventa at Sevastopol, 8/1995. A merchant-design ship outfitted as a fleet oiler with some capability for transfer of solid products in addition to liquids. 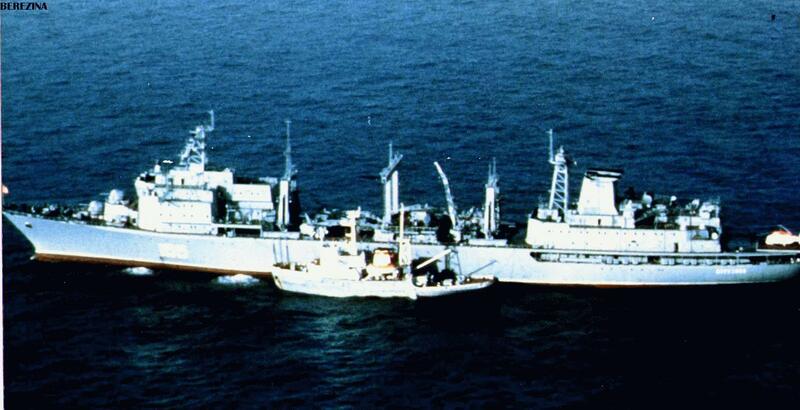 This ship is now (1998) in Ukranian hands. Berezina at sea with a tug alongside. An excellent view of a Project 1826 'BAL'ZAM' (Aziya) class Sudno Svyazyy (SSV; Communications Vessel, i.e. electronic surveillance ship). This class was the first purpose-designed and -built surveillance ships. Previous ships had been converted, mostly from large "factory" trawlers and the like. At 4,900 tons, these ships are quite large and highly capable vessels. An overhead view of a 'BAL'ZAM' class surveillance ship. The Project 537 El'brus class submarine rescue, salvage and support ship. This massive 14,300 ton ship and her sister Alagez are the world's largest and most complex salvage ships. A third unit was not completed; El'brus is now believed to be inactive. The ship features deep submersible support, salvage pumps and equipment, firefighting capability, an icebreaking hull, and four-point mooring gear. Although lavishly equipped for at-sea salvage, these ships apparently have been used mostly for alongside support duties. El'brus made only two short deployments following her 1980 completion. 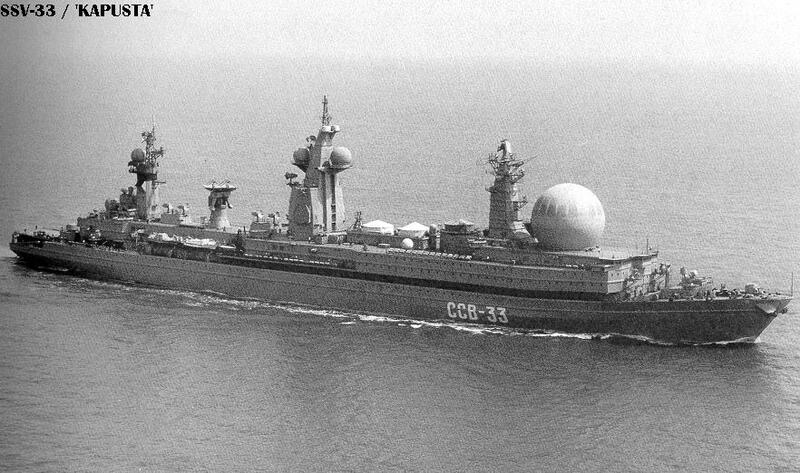 Marshal Nedelin, one of two Project 1914 missile range instrumentation ships, at sea. 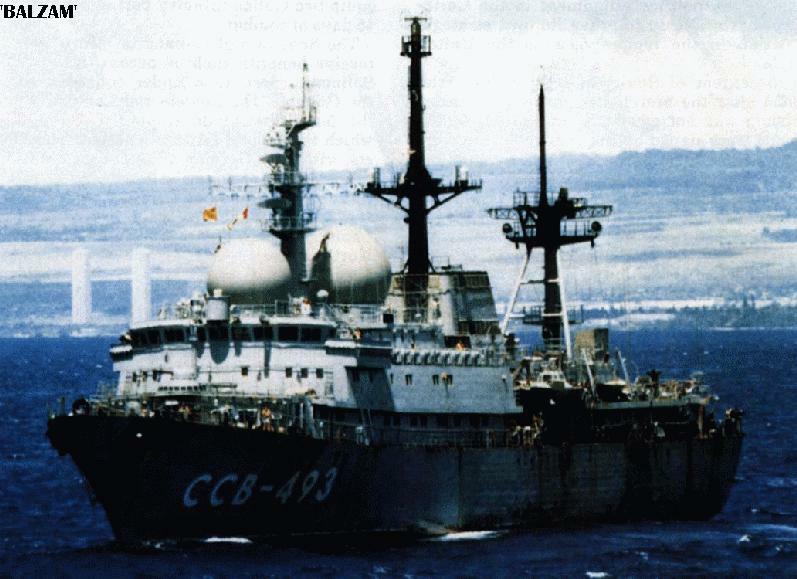 These ships were built starting in the early 1980's to replace older missile range instrumentation ships, with the added role of space tracking and communications. Only two ships, plus a civilian-manned version of greatly modified design, were built. 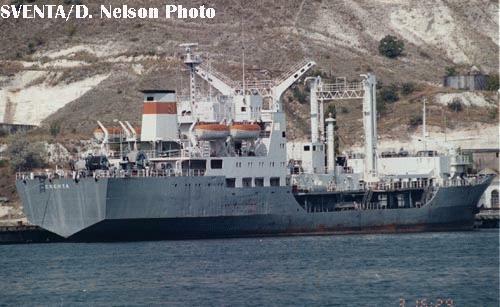 The ships probably are not currently active, and the civilian unit was placed up for sale in 1992.